It is often useful to introduce additional lenses to the optical path between the telescope and the image sensor. These can match a telescope's focal length to the requirements of a specific target and image sensor. Focal reducers (positive lenses), Barlow lenses (focal expander, negative lenses), and eyepiece projection are commonly used to decrease or increase the focal length of the telescope. The geometric placement of the lenses in the optical path is required to calculate their effect on the focal length. Vendors often don't provide the dimensions of adapters and extension tubes needed to perform these calculations. When dimensions are given, it is often not clear if a dimension is the total length or the distance added when screwed into an optical train. The table below gives the optical geometric path length of parts I have in hand for the Questar. 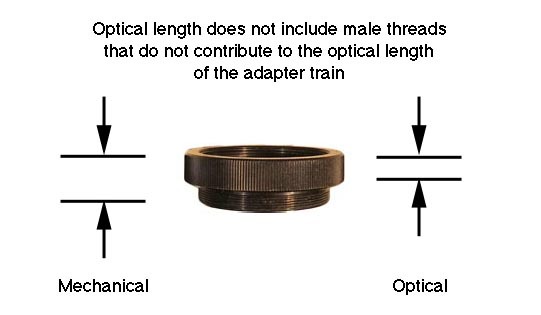 These lengths exclude the overlap of screwed couplings and are measured to the nearest 1mm. Be advised that over time, as vendors change suppliers and specifications, these dimensions may change.